Perhaps you’d like to wake up every morning without having to reach for your glasses. Or maybe you want to play with your kids without always having to worry about your glasses falling off or jostling loose. Laser vision correction, also known as refractive surgery, is a viable alternative for certain patients who want better vision without the use of eyeglasses or contact lenses. 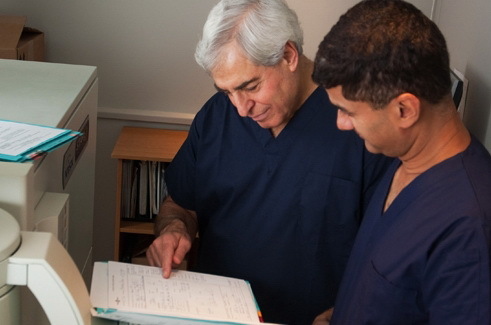 The surgical process behind laser refractive surgery is simple – an experienced eye surgeon reshapes the front of the eye to change its focusing power. Those considering this surgery should visit a Vision West optometrist who will conduct a pre-operative evaluation to determine whether you’re a good candidate for treatment — and to also discuss all your options. Vision West optometrists in Vancouver and the Lower Mainland work with local laser vision correction surgeons to co-manage patient recovery. You will be closely monitored for up to 1 year after your surgery to ensure your overall eye health, vision, and healing process is progressing well. For more information on our laser refractive surgery co-management process, please visit a Vision West eye care clinic in any one of our Superstore locations in Vancouver, Surrey, Delta, and Coquitlam. We look forward to seeing you soon! We are proud partners with London Eye Centre. With two state-of-the-art facilities in New Westminster and North Vancouver, London Eye Centre has been serving the entire Lower Mainland since 1985, dedicated to corrective eye surgery for near sightedness, far sightedness, and astigmatism. Their clinics are also well known for for the ‘No Touch’ PRK procedure which is a non-invasive, bladeless surgery. If you are interested in learning more about laser eye surgery, please do not hesitate to contact Vision West for a consultation to see whether you are a suitable candidate.